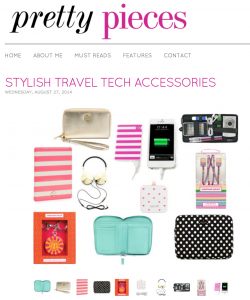 Congratulations to our Client Chic Buds for their feature on Pretty Pieces. We’ve all been there. Stuck somewhere with no outlet in sight…no more! Take charge of your battery life with the ultra slim, compact and light weight Slim Power portable phone charger from Chic Buds! Slim Power is the sleek, dependable and fashionable way to have charging power at your fingertips in any situation! Similar in size and shape to a standard credit card, Slim Power will fit into any purse, wallet, pocket or clutch for ulta-portability!